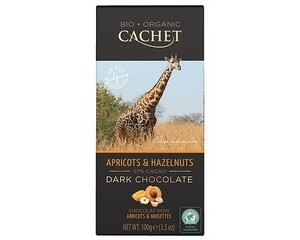 Cachet Organic dark chocolate (57% cocoa solids) with apricots and hazelnuts. 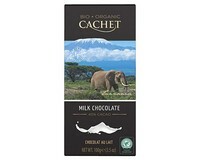 Made with cocoa beans sourced from Tanzania, Rainforest Alliance Certified. Cocoa mass (Tanzania)*, cane sugar*, cocoa butter*, hazelnuts (6.00%)*, dried apricot pieces (0.50%)*, natural apricot flavouring, emulsifier (soya lecithin)*. May contain traces of Egg, Gluten, Milk .